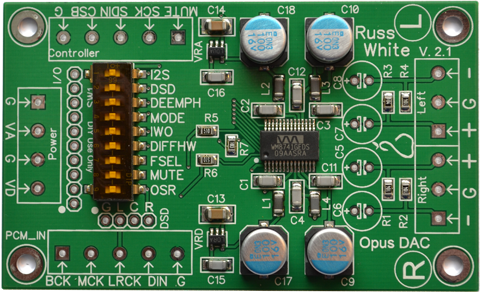 The Opus DAC module is based around the Wolfson's top of-the-line WM8741 DAC chip. It offers I2S and DSD inputs, stereo balanced output, hardware control of DAC options via jumpers, as well as a header for optional software control. The DAC board can also be configured to allow the WM8741 to operate in dual-mono mode (see datasheet for more information). Separate analog and digital power sections feature National Semiconductor low-drop out (LDO) regulators. Power supply electrolytic capacitors are United Chemi-Con NPCAP-PXE, optional output electrolytics capacitors are Elna SilmikII, and resistors are Susumu 0.1% thin film. 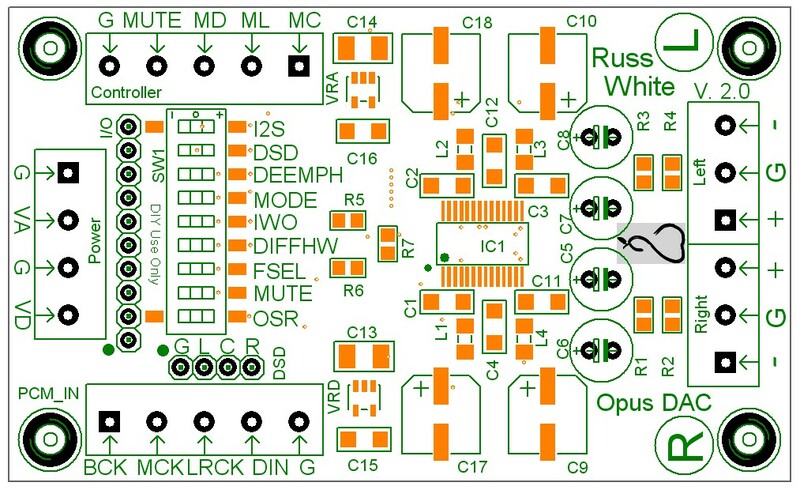 Please note that the terminal blocks and output capacitors come uninstalled to allow for more flexibility (direct wiring, other output capacitors, etc).